[Matt] wanted to have more control over his meat smoker so he built this advanced PID smoker controller. It uses the solid state relay seen in the bottom-right of this image to switch the smoker’s heating element. But all of the other goodies that are included add several features not usually found in these builds. This is a replacement for the commercial PID unit he used on the original build. That monitored the temperature in the smoker, using predictive algorithms to maintain just the right heat level. But this time around [Matt] is looking for extra feedback with a second sensor to monitor meat temperature. Using an Arduino with an SD shield he is able to data log the smoking sessions, and his custom code allows him to specify temperature profiles for resting the meat after it has hit the target temperature. It kind of reminds us of a reflow oven controller… but for food. Hone your fundamental understanding of computer systems by completing this online course called NAND to Tetris. The idea is to develop each fundamental unit that goes into making computer programs a reality. This starts with logic gates, which are put together into modules that eventually become a functioning computer. From there you need an operating system, a compiler, and eventually you’ll be playing a game of Tetris which you programmed yourself. It’s certainly not an easy journey, but if you have a computer at your disposal you should be able to make it all the way through the course. There’s a software suite which includes a hardware simulator so that the computer you’re building can be assembled using HDL instead physical components. The concept is discussed in this TED talk given by [Shimon Schocken]. It is also embedded after the break and in addition to the NAND to Tetris project he shows off some self learning software on the iPad. To us it seems very much like the learning software [Neal Stephenson] envisions in the Young Lady’s Illustrated Primer from his Diamond Age novel. Either through QR codes, RFID, or near field communication, there seems to be some desire to share tiny pieces of data in a more physical and accessible form. [Chris Harrison], [Robert Xiao], and [Scott E. Hudson] of the HCI Institute at Carnegie Mellon have come up with a fairly interesting solution of making data more physical. They call it Acoustic Barcodes, and it’s able to store over a billion unique IDs in a small strip of plastic. By engraving a barcode pattern into a piece of wood, stone, glass, or plastic, the guys then attached a microphone to the barcode and ran their fingernails across their invention. A computer interprets the sounds of a finger scraping against the acoustic barcode and produces a series of 1s and 0s. This binary code can be used to look up various items in a database, or perform actions on a computer. In the video after the break, you can see these acoustic barcodes attached to a whiteboard to provide real tactile control of a video projector. You can check out a PDF of the Acoustic Barcode paper here. I was out to lunch with a couple friends, brainstorming ideas for fun projects when one of them says “Wouldn’t it be cool if we could build a working gravity gun?”. We all immediately concurred that while it would in fact be cool, it is also a silly proposition. However, only a few seconds later, I realized we could do a display piece that emulated this concept very easily. Floating magnetic globes have been around for quite some time. I determined I would tear the guts out of a stock floating globe and mount it on a portal gun, since they’re easier to find than a gravity gun. I would also build a custom companion cube to be the correct size and weight necessary. We’ve already given an overview of the Stellaris Launchpad, but lets look at the first steps to running code on the device. First we’ll get the development software working, then we’ll build and run a very simple example. TI allows use of the full version of their IDE, Code Composer Studio, with the Launchpad’s on-board debugger. To work with Stellaris microcontrollers, you’ll also need to grab StellarisWare. This free software package contains support for the Stellaris devices including peripheral drivers, a USB library, and code examples. Finally, you’ll need the ICDI drivers to communicate with the debugger. TI has all the required software for this board available here. See the TI getting started directions for a walk-through of how to install the required software. 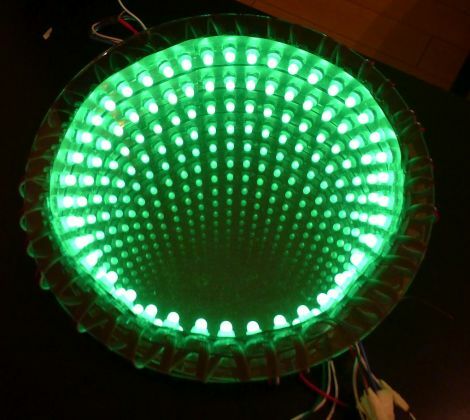 [acorv] recently sent us a link to a cool, interactive infinity mirror (Translation) he built. He was originally a bit gun-shy about sending the project our way, but our recent Reddit AMA inspired [acorv] to submit it via our tip line, and we’re glad he did. Having been lucky enough to score $100 of gear from Sparkfun’s 2012 Free Day, he picked up a pair of addressable LED strips and a Teensy++. He built an LED ring from reflective foil, sandwiching the strips between a mirror and a piece of mirror glass. The resulting infinity mirror looked nice enough, but [acorv] wanted to make the static display a bit more interesting. He added an IR receiver and ultrasonic rangefinder to the mirror’s frame, allowing him to both control the display remotely and detect when people were standing nearby. As you can see in the video below, [acorv] can change the patterns on a whim, and the mirror speeds up the display when someone stops to take a closer look. Looking for an artistic way to build circuits? Don’t want to design a PCB? The Lethal Nixie Tube Clock is a free form circuit that gives you the time one digit at a time. It uses a IN-1 Nixie tube to display the digits. This is driven by ten MPSA42 high voltage transistors. A IRF520 N-FET, inductor, and a diode are used as a switching power supply that generates the high voltage needed to drive the Nixie tube. It’s probably not lethal, but there are exposed high voltages in the cube. You’d definitely regret touching it. An ATMega8 is used to control the clock. It drives the various digits of the Nixie tube, and generates a PWM output to switch the high voltage supply. Unfortunately, the schematic has been lost. If you’re interested in the switching supply, it’s likely similar to the one explained here. Check out a video of the clock after the break.